The first rule in a grammar is always used as the start rule. 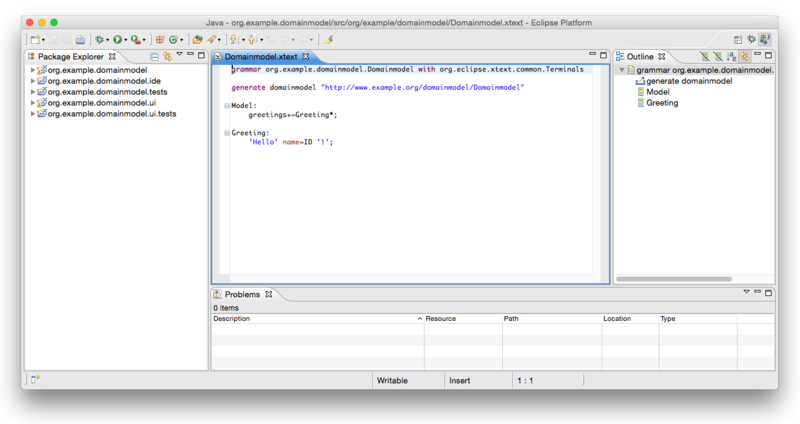 It says that a Domainmodel contains an arbitrary number (*) of Types which are added (+=) to a feature called elements. The rule Type delegates to either the rule DataType or (|) the rule Entity. The rule DataType starts with a keyword 'datatype', followed by an identifier which is parsed by a rule called ID. 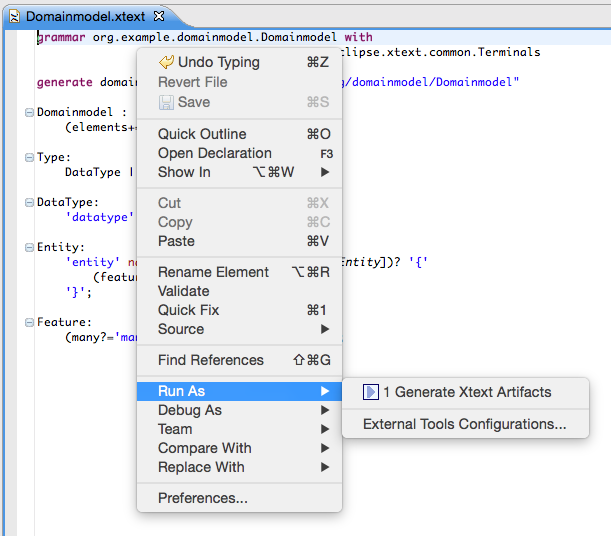 The rule ID is defined in the super grammar org.eclipse.xtext.common.Terminals and parses a single word, a.k.a identifier. You can navigate to the declaration by using F3 on the rule call. The value returned by the call to ID is assigned (=) to the feature name. The rule Entity again starts with the definition of a keyword followed by a name. Next up there is the extends clause which is parenthesized and optional (?). Since the feature named superType is a cross reference (note the square brackets), the parser rule Entity is not called here, but only a single identifier (the ID-rule) is parsed. The actual Entity to assign to the superType reference is resolved during the linking phase. Finally between curly braces there can be any number of Features, which invokes the next rule. The keyword many shall be used to model a multi-valued feature in this DSL. The assignment operator (?=) implies that the feature many is of type boolean. You are already familiar with the other syntax elements in this parser rule. This entities grammar already uses the most important concepts of Xtext’s grammar language. You have learned that keywords are written as string literals and a simple assignment uses a plain equal sign (=), whereas a multi-value assignment uses a plus-equals (+=). We have also seen the boolean assignment operator (?=). Furthermore the example contains syntax elements with different cardinalities (? = optional, * = any number, + = at least once) and demonstrates how cross-references can be declared. Please consult the Grammar Language Reference for more details. Let’s now have a look what you can do with such a language description. 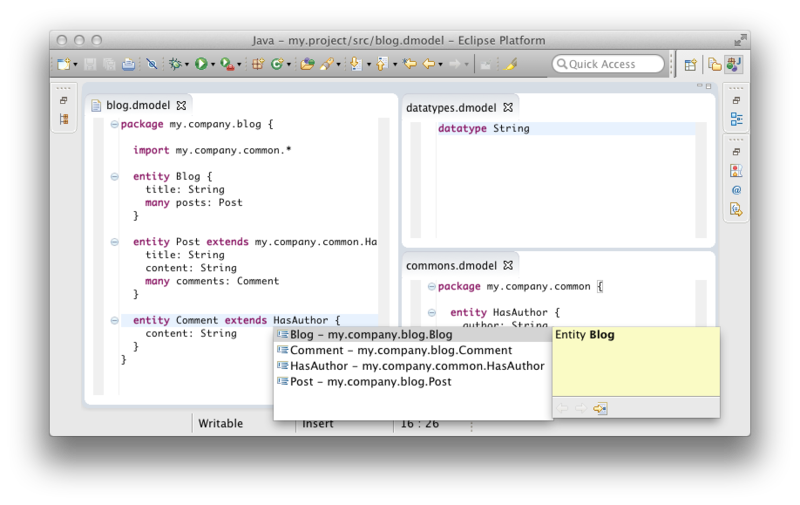 We are now able to test the Eclipse IDE integration. 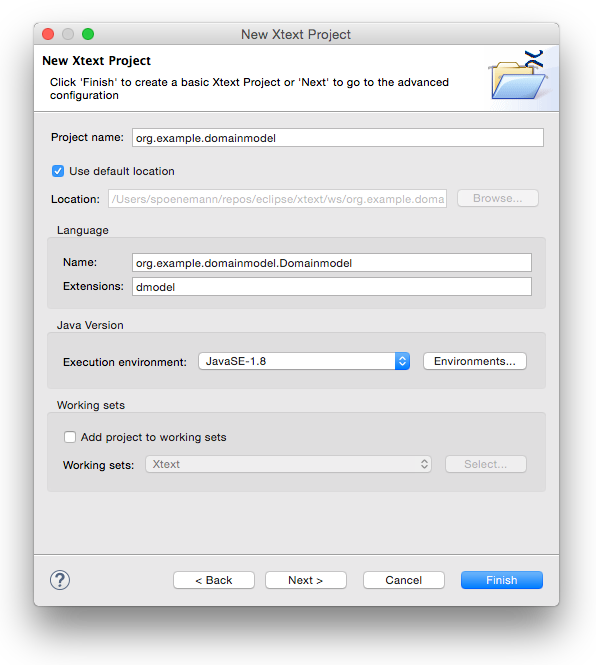 If you right-click the project org.example.domainmodel in the Package Explorer and select Run As → Eclipse Application, a new run configuration is created and launched that starts a second instance of Eclipse including your new language plug-ins. 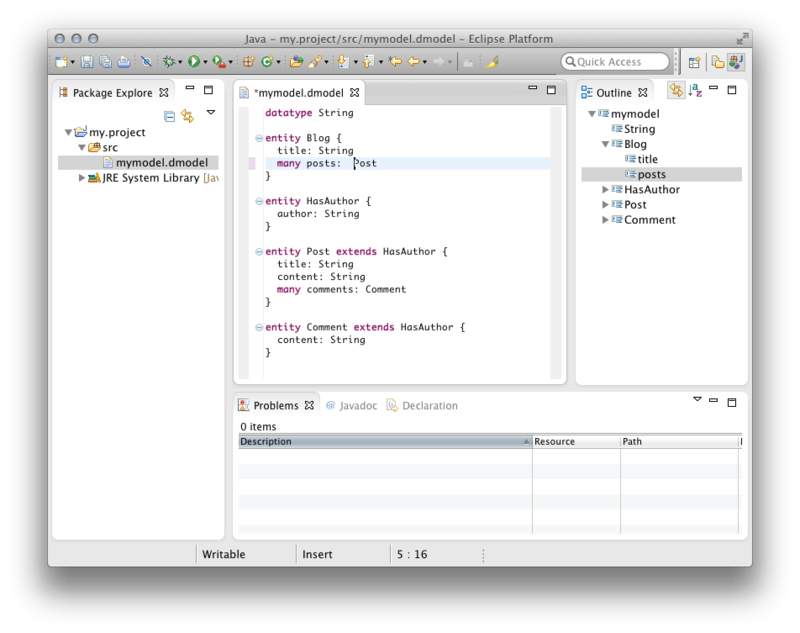 In the new instance, create a new project of your choice, e.g. File → New → Project… → Java Project and therein a new file with the file extension you chose in the beginning (*.dmodel). This will open the generated entity editor. Try it and discover the default functionality for code completion, syntax highlighting, syntactic validation, linking errors, the outline view, find references etc. After you have created your first DSL and had a look at the editor, the language should be refined and incrementally enhanced. The entities language should support the notion of Packages in order to avoid name clashes and to better fit with the target environment Java. A Package may contain Types and other packages. In order to allow for names in references, we will also add a way to declare imports. Let’s start enhancing the grammar. Since a Domainmodel no longer contains types but also packages, the entry rule has to be modified. Furthermore, a common super type for Packages and Types should be introduced: the AbstractElement. A PackageDeclaration in turn looks pretty much as expected. It contains a number of Imports and AbstractElements. Since Imports should be allowed for the root-Domainmodel, too, we add them as an alternative to the rule AbstractElement. The QualifiedName is a little special. It does not contain any assignments. Therefore it serves as a data type rule that returns a String. Hence the feature name of a Package is still of type String. Similar to the rule QualifiedName, QualifiedNameWithWildcard returns a plain string. The last step is to allow fully qualified names in cross-references, too. Otherwise one could not refer to an entity without adding an import statement. Please note that the bar (|) is not an alternative in the context of a cross-reference, but used to specify the syntax of the parsed string. You should regenerate the language infrastructure as described in the previous section, and give the editor another try. You can even split up your model into smaller parts and have cross-references across file boundaries.